Blockchain might be a new technology, but it is quickly making its way through all the industries we know. Then why not utilize the benefits of blockchain to create a platform purely dedicated to artists? This thought is what set Japanese web developer and blockchain expert Tanaka Akihiro on a journey to build a community for artists like never before. 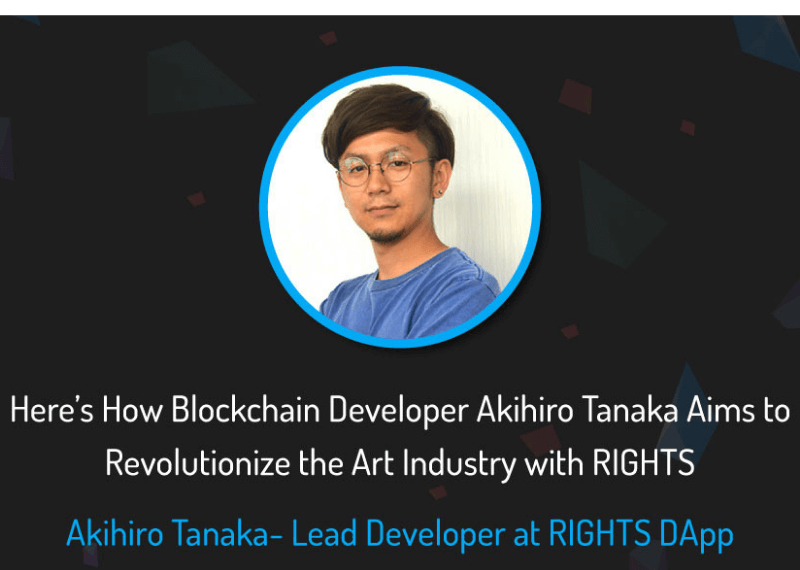 Akihiro with his years of experience as a software developer and his immense love for blockchain technology developed the RIGHTS platform. It is a global platform solely dedicated to both established and amateur artists from all parts of the world. It combines all the latest technologies in the IT space including blockchain to set up a platform that allows artists and creators of various forms to interact with one other and the people supporting them. How RIGHTS Revolutionizes the Art Industry? One key highlight of the platform is its design. The platform implements modern design technologies for its user interface which makes sure that the platform runs smooth across all the devices. Moreover, the platform features a three-layered architecture for better security. Containers based on Enterprise Ethereum Quorum forms the bottom layer which helps in processing transactions faster with speeds 500 and up to thousands transactions per second. The middle layer is a public ledger which maintains a publicly accessible record of all the content that is made available within the platform. This layer monitors and performs all actions related to the content published on the platform along with the money and points that are circulated. The top-most layer is a business contract layer that implements Smart contracts, which helps the platform to function as a mediator for contracts between business institutions and artists. Funding plays a significant role in the growth of any artist. Even though there are online platforms where artists can showcase their work to a global audience, it is challenging to get funding and sell artwork to fans and followers. The RIGHTS platform implements RIS (RIGHTS Infinity Sphere) tokens which will allow its members to send and receive money easily regardless of where they are in the world. It is easy to exchange RIS tokens with fiat currency which increases its efficiency and value. Apart from RIS tokens, the platform will also support the purchase of digital goods within RIGHTS using E-Money. Plagiarism and piracy are two of the major threats faced by all type of artists. Even though several technological advancements have been done in recent years to prevent theft and copying of artwork, they do not provide a complete solution to the problem. As RIGHTS implements the blockchain technology, all the data related to the art content that is made available within RIGHTS is stored in a decentralized public ledger. The platform also implements digital watermark technology which completely removes any chances of illegal distribution of artwork that are made available within RIGHTS. RIGHTS make sure that artists and fans have an opportunity for better engagement within the platform. The “CHAT ON AIR” feature allows artists to conduct live-chat sessions with fans and engage with them. Fans also have the opportunity to get “Trinity Cards” done by their favorite artists and purchase goods sold by artists. The platform will also conduct competitions among artists which allows talented artists to gain more fame for their work. To further improve these user experiences, the user interface of the platform is designed using modern web technologies including Redux, GraphQL, and Ionic. The RIGHTS platform aims at creating a friendly and cooperative platform for artists and fans around the world. With the implementation of latest technologies that solve all common issues faced by artists, RIGHTS is undoubtedly going to become the next big thing for creators and artists around the world.